This is a non-refundable fee to be placed on a wait list for a moorage slip in the Hood River Marina. This is a 4-step process. 1. Select the wait list you wish to be placed on, review the terms and click that you agree, and click Add to Cart. 2. Then, if you already own a boat, please complete the Vessel Information form below. Otherwise, leave it blank. 3. Then be sure to complete the checkout process by clicking the shopping cart icon at the top of this page, verify your order and click Proceed to Checkout. 4. Enter your payment and contact information and complete your purchase. You will receive a receipt of purchase via email. Please select the appropriate boat length. I understand ownership and insurance requirements. 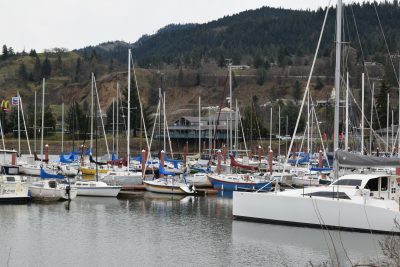 The Port of Hood river maintains three separate wait lists for moorage slips in the Hood River Marina; determined by the overall length of the vessel. (Under 30 feet, 30-45 feet, and over 45 feet). Separate forms and fees are required to be placed on multiple lists. Click here to view the current wait list standings. To be on a wait list, a non-refundable fee of $100 must be paid as well as submission of the vessel information form. This $100 fee is not applied to moorage when a slip becomes available. Payment of this fee does not guarantee moorage rights, because turn-over rate is unknown. Owning a boat is not a requirement to be on the wait list. When a slip is offered, and accepted, a boat must be in the slip within thirty (30) days. Prorated moorage for the remainder of the calendar year will be based upon the date of acceptance. If a boat is not currently owned, the prospective tenant will be given 30 days to purchase a boat to be placed in the slip or provide proof that a purchase transaction is pending. If the 30-day requirement cannot be met and the prospective tenant would like to pass on the offer or a response is not received, the name will remain on the wait list in the current standing unless removal is requested. If a slip offer is declined a second time in within a 12 month period, the name will be removed from the wait list. A new fee and application will be required to be added back on to the wait list, at the bottom of the list. The primary means of communication for wait list offers is email from or waterfront@portofhoodriver.com. It is the responsibility of the prospective tenant to add these email addresses to your Trusted Senders list to avoid missing an offer because it’s in spam; and to ensure contact information is up to date. When a slip offer is made, response is required within five (5) business days. No response is will count as declining the offer. If you have any questions, please contact Marina manager Daryl Stafford via email to waterfront@portofhoodriver.com or (541) 386-0972. I understand that this $100 fee to be placed on the Wait List is non-refundable, and when a slip is offered the fee will not be applied to a slip lease rate. I also agree to notify the Port if I no longer wish to remain on the Wait List, and I understand that the $100 fee will not be refunded to me. I also understand that if a slip is offered, I can pass one time and my name will remain in the same standing on the Wait List. If I decline a second offer within a 12-month period, I understand my name will be removed from the Wait List. A new entry form and payment of the $100 fee will be required to be added back on the List. I understand that a separate form and fee is needed to be on multiple lists (determined by boat length). I further understand that my name will be posted on the Wait List page on the Port of Hood River's website, where I can check my standing on the Wait List. If you already own a boat, please complete the Vessel Information form before completing your purchase. Otherwise, leave it blank.